The Ritz-Carlton, Istanbul has unveiled The Ritz-Carlton Suite, marking the end of a two-year renovation across all of its guestrooms and event spaces. Located on the 14th floor, the 2584ft² suite features floor-to-ceiling windows, providing panoramic views across the Bosphorus. The space was re-imagined by renowned Turkish architect, Hakan Yürüoğlu, who is also responsible for the redevelopment of all banqueting areas including the new ballroom. 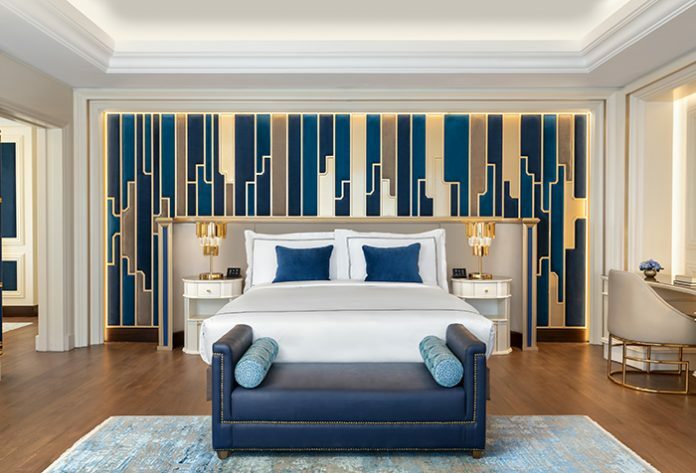 In keeping with the other 243 guestrooms, gold and copper hues are combined with highlights of rich blue to reflect the rich history of the Ottoman Empire. A unique mix of colours and materials have been used to emphasise the grandeur of the city, including stone, wood and metals that showcase the dynamism of Istanbul. The suite comprises a luxuriously appointed king bedroom and separate living room, as well as a spa hot tub with views overlooking the Bosphorus, and two full marble bathrooms with rain showers and soaking tubs. Other amenities include complimentary access to the exclusive, well-appointed club lounge and a 42-inch flat-screen IPTV. For guests travelling in a larger group, The Ritz-Carlton Suite’s three connecting rooms are available to accommodate up to eight people. Paying homage to Istanbul’s booming gastronomic scene meanwhile, the hotel’s Atelier Real Food Restaurant features a menu inspired by contemporary world cuisine and the finest dishes of the Ottoman palace, while the Lobby Lounge offers elegant afternoon tea and the Bleu Lounge Terrace serves cocktails against a backdrop of the Bosphorus. Elsewhere, a wellness centre features a rich menu of facial and total body treatments, an indoor pool and an authentic Turkish Hammam. The hotel is also the only property to offer an open-air spa with treatments overlooking the surrounding waterways.